Normally I don't play games. Oh I've had the occasional opportunity when visiting an acquaintance to pick up a joystick and play a round of Grand Theft Auto or some other video amusement but I myself don't own any games. As such I am only vaguely aware of what's going on in this segment of society. Nevertheless I have run across the occasional piece of information which leads me to believe gaming is a lot bigger than I am aware of. * Consumers spent $25.1 billion on video games, hardware and accessories in 2010. * Purchases of digital content accounted for 24 percent of game sales in 2010, generating $5.9 billion in revenue. * Seventy-two percent of American households play computer or video games. * The average game player is 37 years old and has been playing games for 12 years. * The average age of the most frequent game purchaser is 41 years old. * Forty-two percent of all game players are women. In fact, women over the age of 18 represent a significantly greater portion of the game-playing population (37 percent) than boys age 17 or younger (13 percent). * In 2011, 29 percent of Americans over the age of 50 play video games, an increase from nine percent in 1999. * Fifty-five percent of gamers play games on their phones or handheld device. * Seventy-six percent of all games sold in 2010 were rated "E" for Everyone, "T" for Teen, or "E10+" for Everyone 10+. * Parents are present when games are purchased or rented 91 percent of the time. People spent $25.1 billion in 2010? Billion? Your average gamer is 37 years old? What? I would have thought we were talking about teenagers, not adults. 42% of gamers are women? Boy, I obviously have got the wrong impression about what's going on in this area. Besides playing a game on your computer, there is another segment of games in which you play online, connected via the Internet, with people from all over the planet. A "massively multi-player online role-playing game" is different from your usual video game in that instead of interacting with a computer, you are interacting with other people. Yes, real people. The other person you're talking with or possibly shooting at is actually a real person somewhere out there in cyberspace. The game World of Warcraft or WOW by Blizzard Entertainment is said by the company to have now passed 12 million players worldwide making it, according to Guinness to be the most popular MMORPG in the world. A video game company in Montreal, Canada, Eidos Interactive first published the video game Deus Ex in 2000 receiving critical acclaim. Since then it has released a couple of sequels which have remained top rated. Its latest offering, Deus Ex: Human Revolution was just released on August 23, 2011 and is a prequel to the previous series. Set in the year 2027, the story is about Adam Jensen who is horrifically injured in an attack and ends up with many parts of his body replaced by technology. Like the 1970s television series The Six Million Dollar Man or the Borg of Star Trek, our protagonist is an amalgam of man and machine. In a novel marketing scheme for the game, the company hired a film maker to produce an independent short documentary on the current state of prosthetics however their choice of film maker was both unique and pertinent. In my blog Eyeborg: The Six Thousand Dollar Man I talk about how the video game company commissioned Rob Spencer to make a trip around the globe to investigate the field of prosthetics. The 12 minute video posted on YouTube is a bit of an eye opener to those of us who have never had to deal with the tragedy of losing a body part. Yes, there's the problem of coping but then there are the surprising advancements in technology which clearly point to a future not unlike what was conjectured in The Six Million Dollar Man and further explored in this latest video game. The magazine PC Gamer in their article "The 100 best PC games of all time" (February 16/2011) rated Deus Ex as the number one game of 2010. They had accorded the number one slot to Deus Ex in 2009. High praise indeed. In order to drum up interest in the game, the developers released a cinematic trailer for the game. I grew up a long time ago and had the opportunity to play the game Pong when it came out as something you could hook up to a television set. Anybody remember that? God, talk about primitive! This entire article was prompted by the trailer. In writing the posting on Eyeborg, I investigated the game Deus Ex: Human Revolution and was quite surprised by the state of the art when looking at the trailer for the game. This ain't Pong anymore. Wow, these games are getting closer and closer to offering a computer generated world which mimics the real world. The realism of such films as Toy Story or Kung Fu Panda are startling when I realise the images were put together with a computer. Add on top of that the computer generated special effects of any of a number of science fiction films and you may end up seeing any one of a number of things which doesn't exist in reality. I watched the following trailer and wondered at what point we would see something as sophisticated as what you see in the film The Matrix. Of course, we have nothing which would provide a direct link to our brains so that we could do away with the current set of interfaces like keyboards and joysticks but with Wii, we are getting closer. 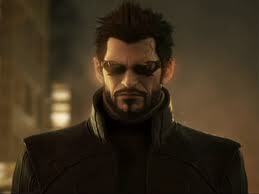 An epic new trailer for the exciting game Deus Ex: Human Revolution. Over five minutes of cinematic footage from Eidos Montreal's sequel. So, if you're into games, it would seem that this latest offering in the Deus Ex series is worth checking out. I certainly found the trailer amazing. To those who are about to play, we salute you. The Entertainment Software Association (ESA) is the trade association of the video game industry in the United States. It was formed in April 1994 as the Interactive Digital Software Association (IDSA) and renamed on July 16, 2003. It is based in Washington, D.C.
Deus Ex (abbreviated DX) is a cyberpunk-themed action role-playing game developed by Ion Storm Inc. and published by Eidos Interactive in 2000, which combines gameplay elements of first-person shooters with those of role-playing video games. The game received near-universal critical and industry acclaim, including being named "Best PC Game of All Time" in PC Gamer's Top 100 PC Games. Deus Ex: Human Revolution [is] a monumental achievement, and hopefully one that will garner enough commercial success to prove influential on the industry. It shows that you can balance complexity and depth while still making a game accessible and heaps of fun to play. If any game can break the stranglehold that dumb grey-brown shooters have on the console market, this is it. Rob Spence, a Toronto film maker, lost his sight as a child in a shooting accident. Complications arose and six years ago, he actually had the eyeball removed from its socket. Being a fan of the 1970s television series The Six Million Dollar Man, he apparently had a flash of inspiration when looking at his cell phone camera and realised something that small could fit into his empty eye socket. Google image search: "deus ex"
Google video search: "deus ex"